The author said in the introduction section: "When I was eight years old, 'What is God?' I had to memorize the flawless answer to the question: 'God is the supreme soul, he has no partner and who is self-sufficient.' It is not surprising that, this answer did not seem very meaningful to me. I'm forced to say, this answer still cools me down. It has always been seems to be a singular, unobtrusive, and overwhelming definition. Of course, since the book has started to write, I started to believe that the answer is not correct. And so, how monotheistic religions develop a very different concept about God, he analyzed that issue in this book. 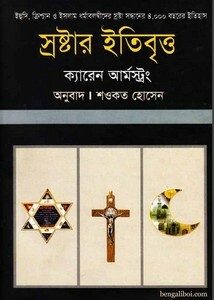 The book 'A History of God' originally written by Karen Armstrong and its translated into Bangla by Ahowkat Hossain. The ebook has 532 pages, 12mb pdf size. Quality- good but watermark.